This is a list that will be updated regularly with all the area Fall Festivals, pumpkin patches, haunted houses, and other Halloween events. If your organization has something going on and would like to be included, email ccfunforkids@gmail.com or let us know on our Facebook page! Please check with the organization for the most updated information. Also, I don't mind sharing the info but please be courteous and give credit to CC Fun for Kids! Hours: Fridays 5 pm-9 pm,Saturdays 10 am-8 pm, Sundays 1 pm-5pm. Runs September 27 through November 30, 2014. Rockin’ K Maze will be closed Halloween weekend and Sunday, November 16, 2014. 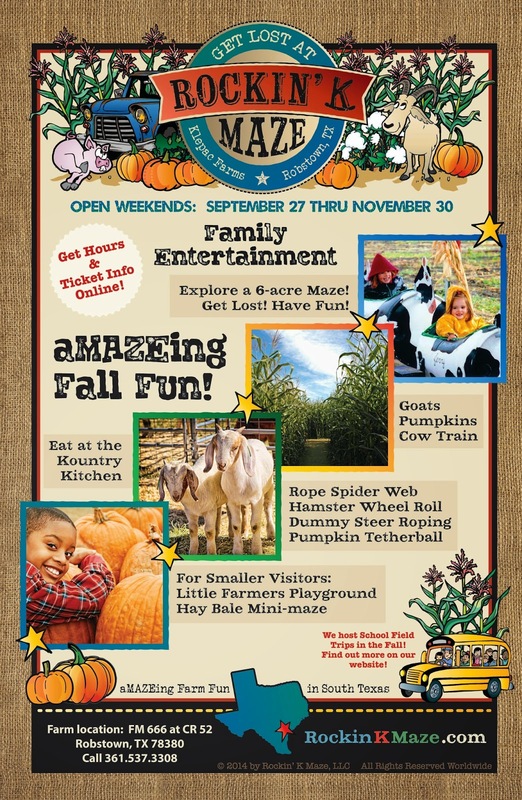 Explore our 6 acre maze, Spider Web, Dummy Steer Roping, Pumpkin Head Tetherball, Hamster Wheel, Lil’ Farmer’s Playground, and Hay Bale Mini-maze! Admission prices: Adults (4-64) $10.00 + tax, Seniors (65+) $ 8.00 + tax, Children 3 and under are free! Cow train $ 1.00 (Ticket includes one ride on the cow train). For information call 361-537-3308 or visit http://rockinkmaze.com. 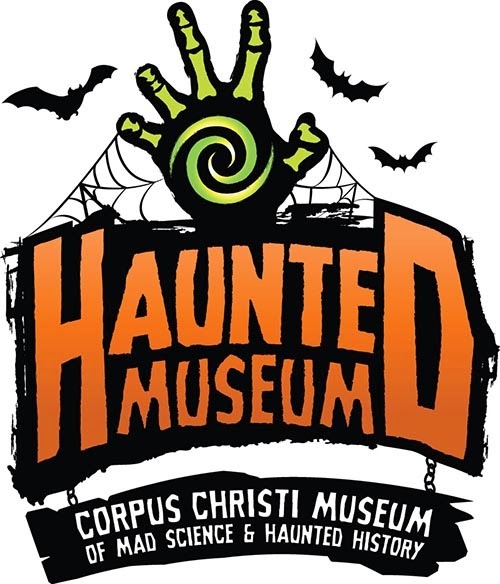 A scary transformation will take place at the Corpus Christi Museum of Mad Science and Haunted History. It’s a haunted museum that is sure to scare, but welcome children & families… if they dare! PG-PG13 Haunted Maze-- a kinda scary experience that will thrill!! For information call (361) 826-4667 or visit https://www.ccmuseum.com. Strange things are creeping along Corpus Christi Bay. LEX will be haunted from October 10 to November 1 and the ghosts will be waiting for you! Castle of Terror Productions and LEX have a ghost ship tour you’ll never forget! The terrifying tour takes the bravest of souls down to the 2nd and 3rd decks of the WWII era aircraft carrier to spaces never before opened to the public. You should be ready to handle steep ladders, dark corridors, creaky hatchways and unimaginable sights, screams and sounds. This is an intense haunted experience – think twice before enlisting! Every Friday and Saturday until the end of the month! Ages 6 and up, must be able to navigate ladders and confined spaces. Oct 24-25 and Oct 30-Nov 1 from 8-11pm. Come get scared for the animals!! 100% of the proceeds go to support the Texas Sealife Center!! We will also have activities for the kiddos and the ones who don't want to be scared!! Hope to scare you there!!!! Runs from October 3rd through the 29th. There will also be storytelling at the Pumpkin Patch Monday through Friday from 9:30 AM - 11:30 AM starting Oct. 6th and ending the 25th. Call (361) 991-4342 for more information. Runs from October 6th through 31st. Cost of pumpkins: .50c up to $40 (priced by size). Proceeds go towards their church's youth. Runs from October 8th until October 31st. 4545 Wildcat in Portland, TX (next to the High School). Runs from October 13th through October 30th or until sold out. The Patch will include pumpkins and gourds of all shapes, colors, and sizes. People of all ages are invited to visit our patch daily to select that “perfect pumpkin” just right for their family. Prices for this pumpkin fundraiser range from $1.00 to $35.00+. Feel free to come by and take pictures and wander through anytime. The patch will be open daily for school field trips and visits. Proceeds from our Pumpkin Patch go to support our Youth and Children’s Ministry programs. Call 361-777-2000 for more information or to schedule your field trip. Bundles of Care Pre-K Center Fall Fest from 11am- 4pm! Food, games, prizes & a haunted house! All proceeds will be donated to the American Cancer Society for the Making Strides Against Breast Cancer Walk! 902 16th St.
Anita & W.T. Neyland Public Library Octoberfest at 3 p.m. Ready for chills, thrills and laughter? Visit our Haunted House for an experience you won't forget. We will also have games for the little ones. Don't forget to wear your favorite costume. Refreshments. 1230 Carmel Pkwy. Contact (361) 826-2370 for more information. Grace United Methodist Church Harvest Fair from 10 am - 4 pm. 14521 Northwest Blvd. 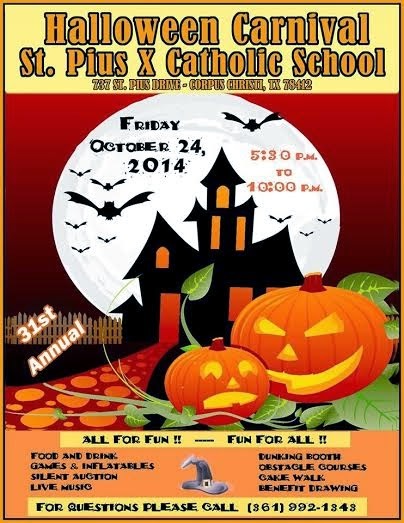 St. Patrick School 52nd Annual Halloween Carnival from 5:30-10:30 p.m. 3340 S. Alameda. For more information call St. Patrick School at (361) 852-1211. Owen R. Hopkins Library Spook or Treat at 3 pm. Come join us for a spooktacular time of stories, craft and trick or treating in the library. Please wear your costume. 3202 McKinzie Rd. Contact (361) 826-2350 for more information. 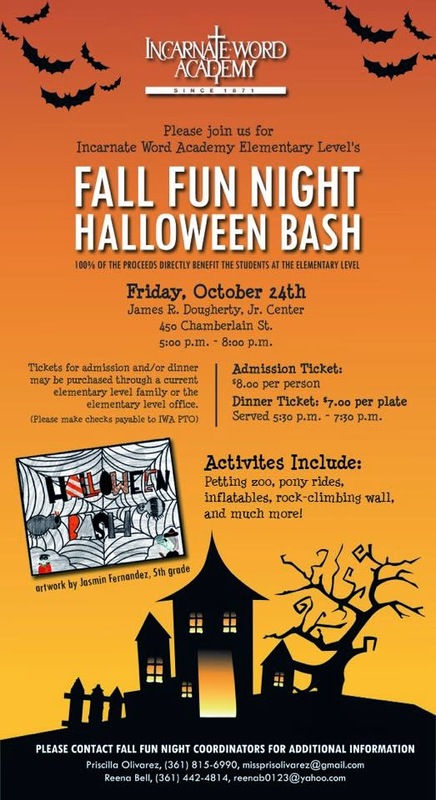 Church of Reconciliation Day School's Annual Family Friendly Haunted House from 6:30 PM - 8:30 PM. For all ages. 4518 Saratoga. Call 361-852-9676 for more information. 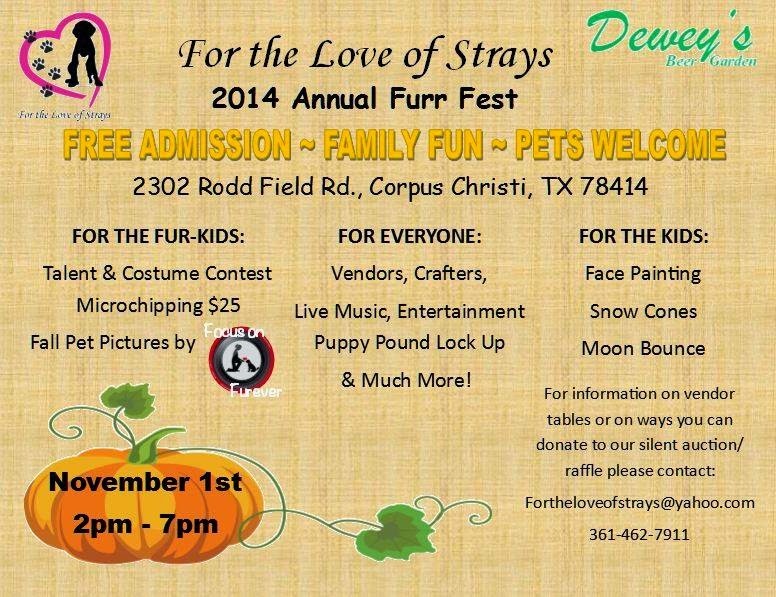 Gulf Coast Humane Society 4th Annual Pawfest from 11 am - 5 pm. There will be tons of games, vendors, prizes, tricycle races, costume contests, a spooky photobooth, face painting, and FREE FOOD! Webb Elementary Starfish Fall Festival from 3-8 pm. 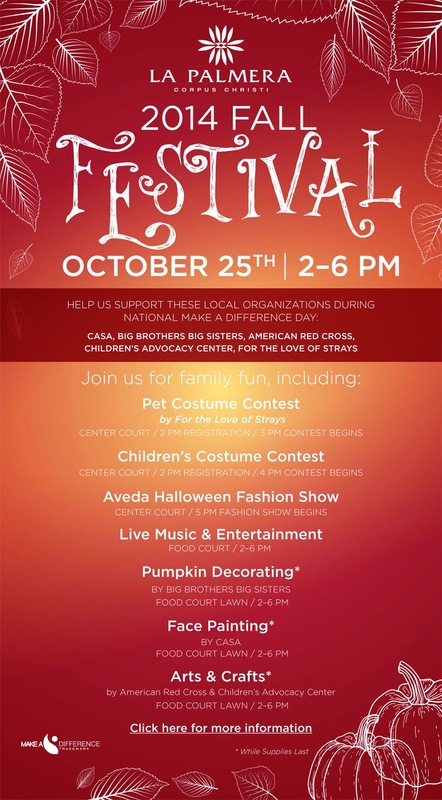 Join your friends and neighbors at our annual Fall Festival on Sponsored. The Starfish Festival raises money for educational materials, technology tools and campus improvements that our staff requests during the school year. This year will be bigger and better than ever with games, inflatables, a rock climbing wall, music, a gift basket raffle, silent auction, face painting, delicious food and more! If you have any questions or would like to help, please contact our fundraising chair Julie Joyce at (361) 816-5243 or by email .Enjoy turkey legs, sausage wraps, brisket sandwiches, hot dogs , pizza, nachos, frito pie, corn cup, cotton candy, pickles , whole fruit, and more! Kona Ice will be selling customizable Sno Cones and we’ll have sodas, water and juice for purchase. Boys & Girls Club of Corpus Christi Annual Halloween Carnival from 6-8pm. 3902 Greenwood Drive. Boing Boing Bounce 1st Annual Halloween Boo Bounce from 5-7 pm. 3403 S Padre Island Dr #103. For information call (361) 855-0825. Flour Bluff Community Fall Fair starting at 8 am. 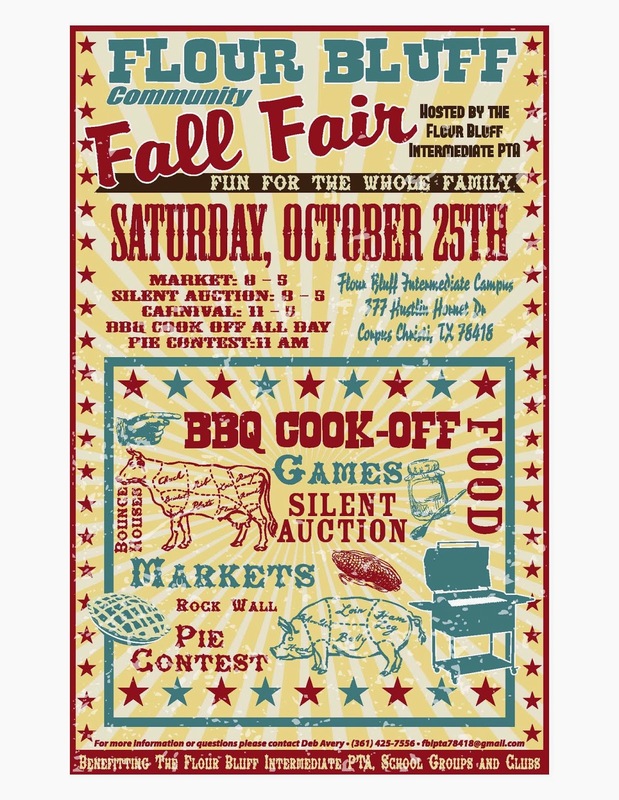 Sponsored by the Flour Bluff Intermediate School PTA, the fair is an opportunity to bring the community together, and for clubs and organizations to fund raise in a central location. BBQ COOK-OFF: Categories are - Open Seafood, Beef Fajitas, Chicken and Pork Ribs. Entry is $75 per team, includes all categories. Prizes will be awarded for Overall Grand Champion, Reserve Grand Champion, and 1st, 2nd and 3rd prizes in each category. Set-up is 6am with prizes awarded at 6pm. PIE CONTEST: Categories are Apple, Pumpkin, Chocolate and Baker's Choice. Pies will be accepted from 11am - 1pm. Prizes will be awarded for Overall Grand Champion, Reserve Grand Champion, and 1st, 2nd and 3rd prize in each category. Winning pies will be auctioned off and all others will be sold. Entry fee is $7 first pie, $5 each additional pie. To register in contest call (361) 425-7556 or fbipta78418@gmail.com. CARNIVAL: The carnival opens 11am-5pm. Featuring games, food, activities, etc. Contact Dana Lambert@ (361) 533-3623 or dana.lambert@rocketmail.com. The Flour Bluff Intermediate PTA is also looking for volunteers, sponsors and donations. This is a great event for your business, civic club, or community organization. For additional information, contact Deb Avery at (361) 425-7556 or fbipta78418@gmail.com.Flour Bluff Intermediate School campus, 377 Hustlin' Hornet Dr.
Michaels Stores Kids Club “Face painting + decorate a Halloween treat bag” from10am – noon. Just $2 per child for 30 minutes of creative craft fun, supplies included. Ages 3 and up. Sessions starting every half hour from 10:00 am - 11:30 am. See a store associate to join the fun! 4717 -E S Padre Island Dr. Call (361) 851-9360 for more information. Barnes & Noble Special Halloween Storytime at 11:00 AM. "Fans of the 'Click, Clack, Moo: Cows That Type' series will love this new title destined to be a Halloween classic - Click, Clack, Boo! : A Tricky Treat. Join us for this Halloween Storytime with fun-filled giveaways and activities. Trick or treat?" 5129 Blanche D Moore Drive. For information call 361-992-1339. Our Lady of Guadalupe Parish in Sinton MEGA Festival from 11 a.m.-11 p.m. There will be food, a variety of booths, games for the kids and a raffle prize drawing with $25, 000 worth of prizes. Live music this year by Ricky Naranjo Y Los Gamblers, Jaime Y Los Chamacos, Clarissa Serna. Special events this year include a 5K Fun Run, a Silent Auction, and a BBQ Cook Off. Admission is free. For more information call the parish office at (361) 364-2210. San Patricio County Fairgrounds - Events Center Arena, 219 W 5th St, Sinton. Luther Jones Elementary Jonesfest "Waves of Fun" from 11am to 2pm. Inflatables, slides, tons of games, face painting, cake walks, BBQ, silent auction and much more! Come Join the Fun! 7533 Lipes Blvd. 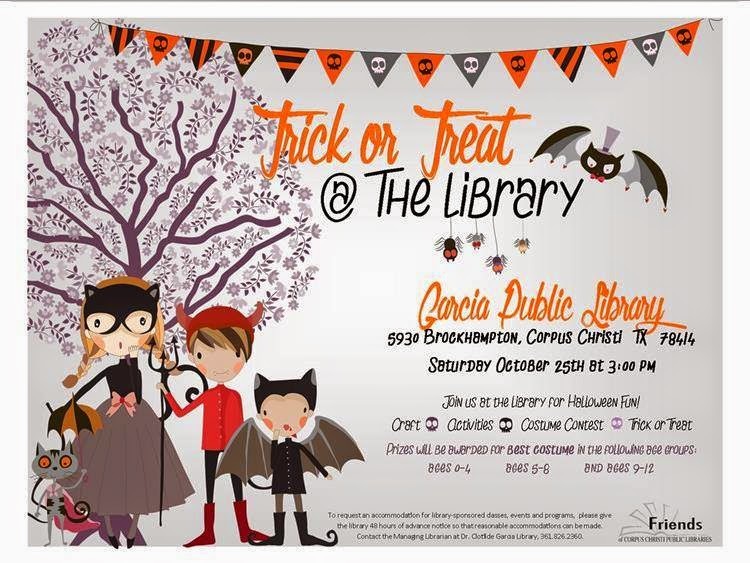 Trick or Treat in the Library at Dr. Clotilde P. Garcia Public Library at 3 pm. Join us for our annual Halloween fun. 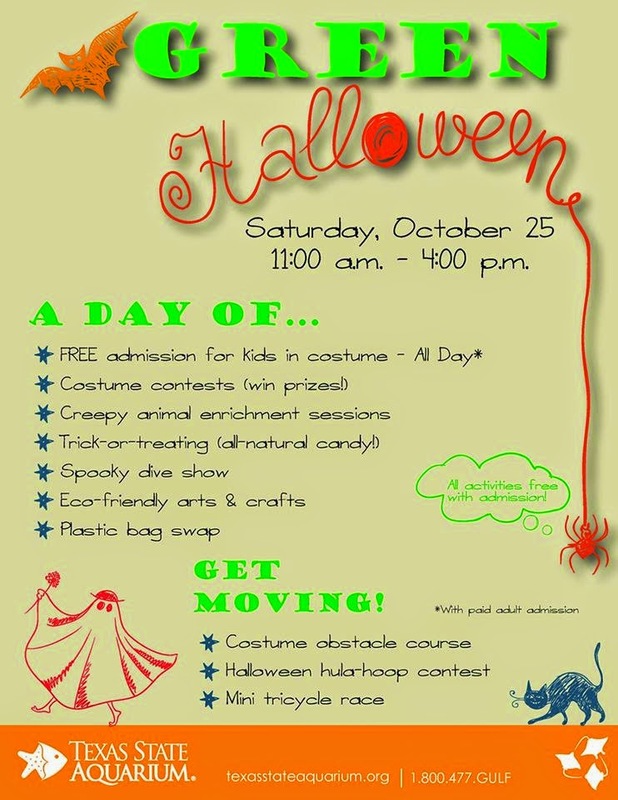 Activities include a craft, games, face painting, costume contest (for ages 0-12), and trick or treating of course! Contact (361) 826-2360 for more information. 5930 Brockhampton. Fall Festival at Lexington Baptist Church from 3:00 – 6:00 pm. Come join us for games, food and lots fun!!! Bounce house, music, cookie walk, face painting, games, hotdogs, popcorn, lemonade and more. Wear a costume and come join the fun! 3525 SPID. Kings Crossing Church of Christ Trunk or Treat from 5:00 - 7:00 pm. Trick or Treating among the Trunks, games, bounce houses, hot dogs, and a Cake Walk. 5901 Yorktown Blvd. 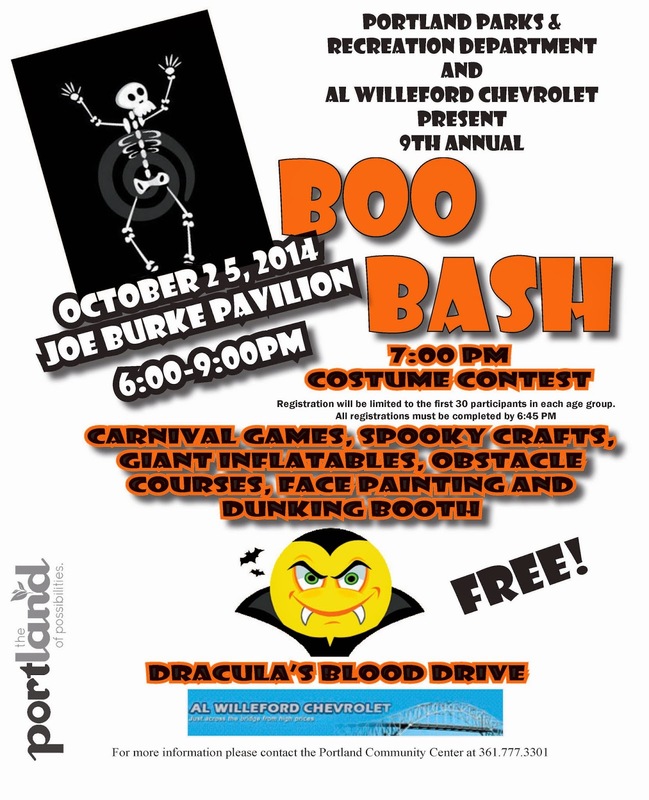 City of Portland 9th Annual Boo Bash from 6:00 – 9:00 PM. Events will include a costume contest for children and pets, a pumpkin decorating contest, carnival games and inflatable slides. Contests are limited to the first 30 pre-registered in each age group. Register: 6:00-6:45 PM, day of the event (costume contest begins @ 7:00 PM). Registration ends promptly at 6:45 PM. The Blood Mobile will be on site; parents donate blood and save a life. An easy way to make a big difference in your community while attending this FREE event! Joe Burke Pavilion, 2003 Billy G. Webb, Portland, TX. Fall Festival at Our Lady of Refuge at 10:30 a.m. Featuring a Country Store, BBQ chicken dinner for $8 donation, children's carnival, costume contest, silent and live auctions and a raffle drawing at close of the auction. Many great prizes. Our Lady of Refuge Church (1008 S. Alamo St.) in Refugio. St. Theresa Church Spookfest 2014 Under the Big Top from 11 a.m.-5 p.m. Brisket and sausage will be served with sides and a drink for $8 a plate from 11 a.m.-2 p.m. (take-out available). Featuring a Country Store, live and silent auction, costume contest, coloring contest, craft vendors, food and game booths. For information regarding craft vendors contact jannell@popcorn etc or (361) 851-0372. at (1302 Lantana Street). For questions contact St. Theresa Church at (361) 289-2759. Our Lady of San Juan de los Lagos, Mother of the Church Great Church Festival from 11 a.m.-9 p.m. Entertainment will be provided by different musical groups, a variety of foods, games for children, loteria Mexicana, refreshments, raffles etc. 1755 Frio St. in Los Encino's neighborhood -the area around the church and the existing buildings. Galilean Lutheran Trunk or Treat from 6:30 to 7:30 pm. 3321 Cimarron Blvd. DMC Fire/EMS Club “Tower of Terror” from 6:00 -11:00 pm. Fear reigns supreme during Del Mar College’s Fire/Emergency Medical Services Club’s annual “Tower of Terror,” a fundraiser benefiting the Emergency Medical Services/Fire Science scholarship fund. Four floors of scares and fright scenes transform the Department of Public Safety Education Burn Tower into a multi-story fear factory. Admission is $5 and not recommended for children age 10 years or younger. The Fire/EMS Club will have a concession stand as well as offer a dunking booth, drunk driving carts along with face painting and an inflatable moonwalk for younger children. Cost is $5 for appropriate aged participants. For more information, contact Melissa Stuive at 698-1724 or mstuive@delmar.edu. Public Safety Complex, Del Mar College West, Airport and Old Brownsville Rd. Chuckles Comedy Club Halloween Magic Show begins at 8pm show starts at 9pm. All ages magic show at! Kids tickets are only $6 (12 and under) in advance and adult tix are just $8 in advance. 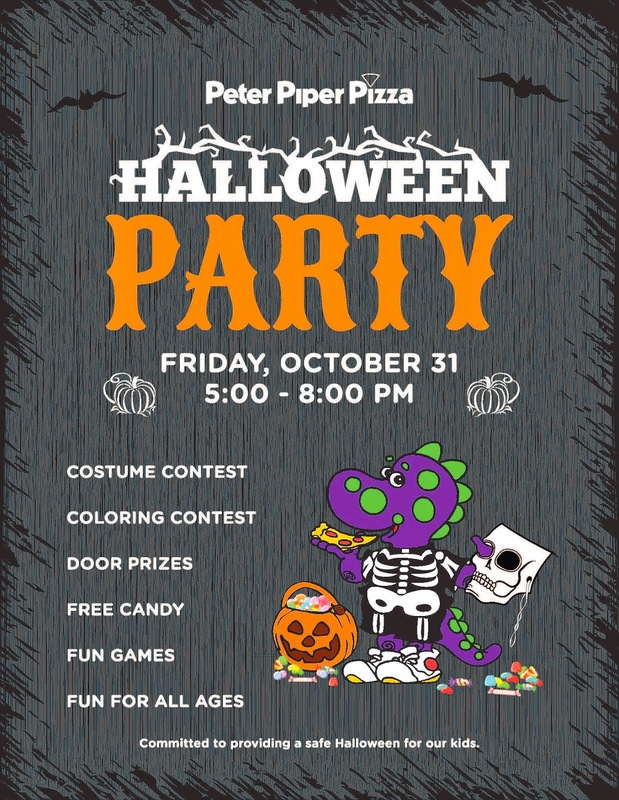 FREE Halloween candy and great pizza specials! For more info call 361-434-4290. Purchase tickets early at Mesquite St Pizza and Pasta Co. or online at http://www.chucklescorpuschristi.com. Gattitown Corpus Christi Halloween Carnival from 5 to 8:30pm. Join us for Halloween fun and games! Ping pong toss, monster bowling, costume contest, plinko, pumpkin knock down, and more! 5513 Saratoga Blvd. Texas A&M University-Corpus Christi Islanders Baseball the Halloween Game from 6:00 to 7 p.m. Come on out to Chapman Field for some baseball and some great family fun. Remember it's all FREE! Located on campus, take a right at the first light on Island Blvd. Be sure to stop at the security gate to secure a visitor's parking pass. Take the second left (Oso Drive) then turn right after the police station on Dolphin Lane. Follow Dolphin Lane around to the left, and park in the Turtle Cove Parking Lot on right. Chapman Field will be just on the other side of the parking lot. 6300 Ocean Dr. Early Scholars Academy Fall Festival from 9:00-11:30 am. 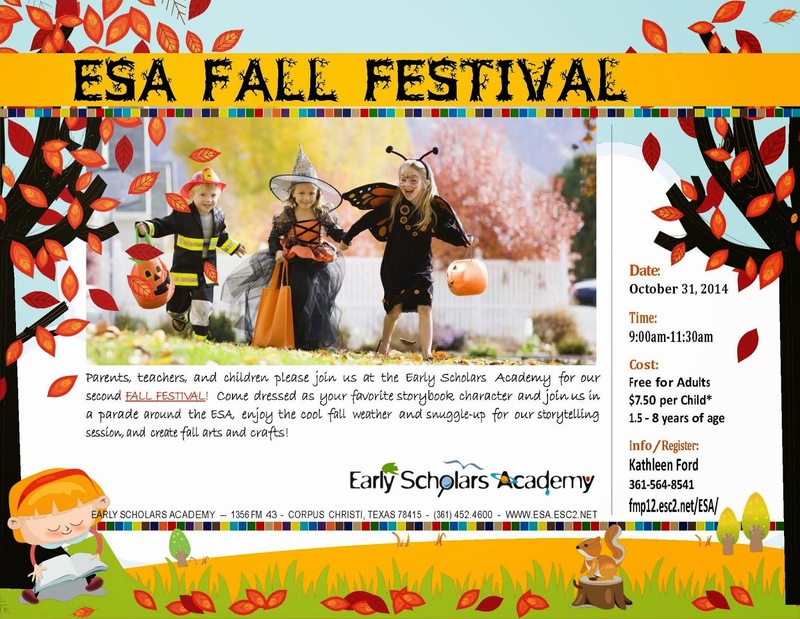 Parents, teachers, and children please join us at the Early Scholars Academy for our second FALL FESTIVAL! Come dressed as your favorite storybook character and join us in a parade around the ESA, enjoy the cool fall weather and snuggle-up for our storytelling session, and create fall arts and crafts! $7.50 per Child (1.5 - 8 years of age), free for Adults. 1356 FM 43. For information and to register Kathleen Ford at 361-564-8541 or visit fmp12.esc2.net/ESA. 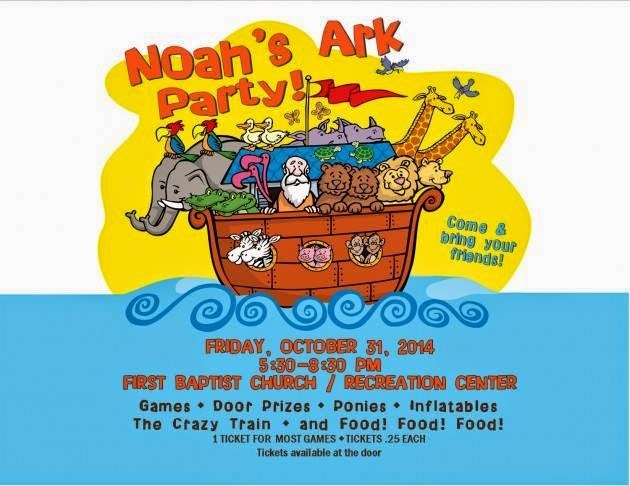 First Baptist Church Noah's Ark Party from 5:30-8:30pm. There will be games, door prizes, ponies, inflatables, the Crazy Train and food, food, food! 1 ticket for most games, tickets are $.25. Tickets are available at the door. Recreation Center, 3115 Ocean Drive. Grace United Methodist Church Trunk or Treat from 6-8 pm. Games, Prizes and Treats for the Kids. Prizes for best decorated vehicles. Free Hot Dogs, Chips and Drinks to the first 200 people. 14521 Northwest Blvd. Calallen Baptist Church Trunk or Treat from 5:30-7:30 pm. Contact Victoria Rodriguez if you have any questions 361-241-4272 or forthechildren.cbc@gmail.com. 13505 IH 37. Journey Church Corpus Christi﻿ Trunk-or-Treat at 6pm. 12150 IH 37 at Callicoatte Rd (Annaville). The Believers' Fellowship Church Trunk or Treat from 6-8 pm. Free Family Fun! Hot dogs, popcorn, soda, bounce house, and more! All free! 4420 S Staples St. For information call 361-334-9723. Kingsville - The Texas A&M-Kingsville University (TAMUK) Trunk-or-Treat from 6-7 p.m. Led by the members of the TAMUK Student-Athlete Advisory Committee (SAAC) with Whataburger as its presenting sponsor Javelina student-athletes will decorate their vehicles for Halloween and park them along University Boulevard. They will then hand out treats to members of the community as they walk around the area. Trunk-or-Treat is an event that provides a safe environment for children to go trick-or-treating on Halloween. All sports will decorate a vehicle and children will "trick or treat" throughout the parking area. University Boulevard immediately adjacent to the Memorial Student Building (MSUB). For more information, please contact 361-593-4268 or hanna.lantz@tamuk.edu. Church of Acts Trunk-N-Treat from 6 to 8:30pm. 3811 Carroll Lane (church parking lot). 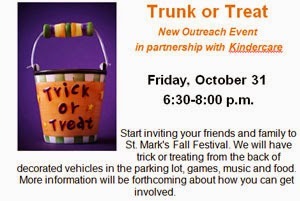 St. Mark's Episcopal Church Trunk or Treat from 6:30 to 8pm. Family fun on Halloween! We will have trick or treating in the parking lot, free hotdogs, snow cones, popcorn and children's games! Open to everyone! Wear your costumes - not too scary! 2727 Airline Rd. 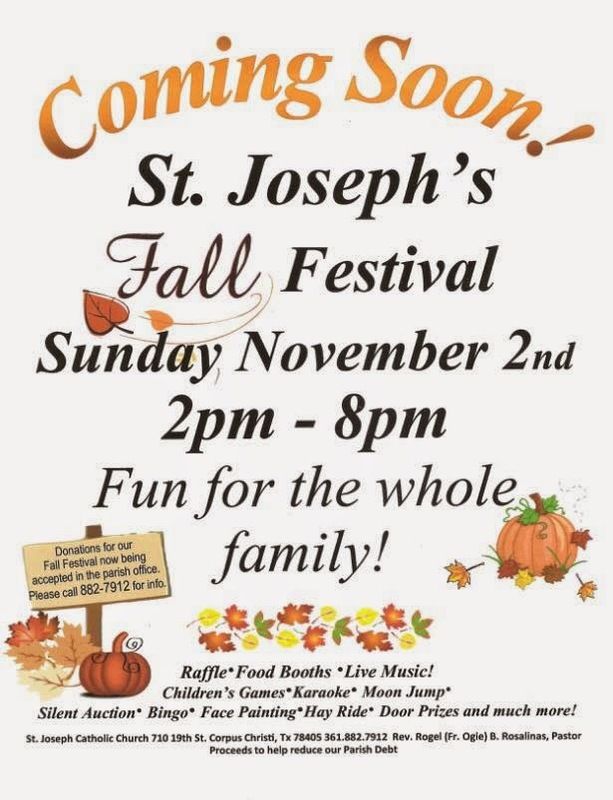 St. Joseph Annual Fall Festival from 2:00 PM - 8:00 PM. There will live music, a raffle, games for the children, a silent auction, karaoke, face painting, moon walks, and lots of great food! Come taste the delicious turkey legs, menudo, funnel cakes, roasted corn, Frito pies and more from our food booths. There will be seating available and you are welcome to bring your lawn chairs too! The proceeds from this fundraiser will help to reduce our parish debt. If you would like to help sponsor our Annual Fall Festival, or if you would like to donate any items to our silent auction, please call the parish office at (361) 882-7912 or email sjoffice@stx.rr.com. 710 South 19th St.